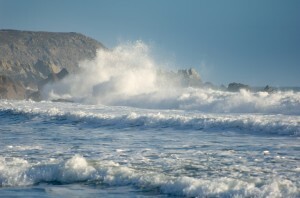 After the recent stormy weather disturbances, officials that have been monitoring the Cornwall coastline and have issued severe warnings that erosion in some areas may be significantly increasing. Members of a coastal research team from the University Of Plymouth have been observing the ongoing changes over the past three years that are happening along Cornwall’s coastline. The team at the University are carrying out these observations using the latest equipment such as seismometers, acoustic devices and thermal imaging cameras. Each of these devices enable the smallest sounds to be picked up from the coast throughout the duration of a storm and can even detect them after a storm has taken place. This project is thought to be one of the most widespread experimentations of its kind. A Professor who specialises in Coastal Geomorphology, Gerd Masselink, who is head of the assignment said; "We want to understand under what conditions and under what tides the beaches and cliffs are able to withstand the waves, or under what conditions they flood and fail”. The Professor also predicts that the recent outburst of spontaneous weather could possibly aggravate coastal erosion in some areas by a gigantic 1000%! Another area seen to be strongly affected by the disastrous weather abnormalities is the town of Portland in Dorset. Portland is home to the well-known prehistoric formation known as Pom Pom rock, it is said to have weighed an awful lot and dates back hundreds of thousands of years ago however, due to the recent damaging weather Pom Pom rock has been left resembling a pile of rubble because of the towering waves and fierce winds that where reaching speeds of up to 80mph. Further coastal erosion is expected as more and more seaside towns are caught up directly in the path of the unexpected weather which could be lurking on the horizon. No methods as such have been discovered to help conquer the ever eroding coastal walls aggravated by the climate changing weather however, people and officials are coming up with ideas as to how they may be able to deal with it. One idea is to manufacture plastic reefs, acting as flood defence/protection barriers in preparation for future storms that may occur. This idea stems from the current method of using concrete blocks to help protect areas from flooding. A good example of this is the promenade which protects the Wirral coastline in the North West of the country from the rough high tides of the Irish Sea. However, using concrete produced enormous amounts of CO2 during manufacture therefore, using recycled bails of plastic materials could be more beneficial. This is because the use of recycled materials could reduce the use of landfill sites and wouldn’t use as much CO2 to manufacture compared to concrete. Do you think that it is a good idea to use recycled plastic materials to act as a barrier against storms or could it in fact pollute UK’s sea water?